This time of year serves as a reminder that a drop in tire inflation pressures corresponds with the falling thermometer readings. Air pressure in a tire typically goes down on or two pounds for every ten degrees of temperature change. 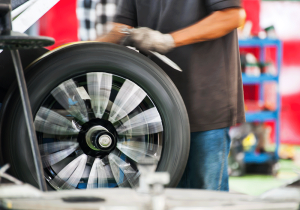 Maintaining proper air pressure is the single most important thing drivers can do for their tires. Under inflation is the worst enemy a tire can have, as it causes increased wear on the tread on the shoulder area on the outside edges of the tire. It also generates excessive heat, and it can reduce fuel economy by increasing rolling resistance, this is because soft tires make the vehicle work harder. We suggest checking tire inflation at least once per month with a reliable gauge. To find the proper air pressure for a tire, look in the vehicle owner’s manual, in the glove box or on the driver’s side door jamb. The inflation pressure stamped on the sidewall of a tire is the maximum pressure, not the recommended pressure. The evolution of in-dash tire pressure monitor systems on new vehicles will likely help more consumers to pay attention to their tires’ pressure levels. It is important to still check the tires by using the inflation gauge so you can see how much air each tire has. At least once a month, take a few minutes and check your tire pressure with an accurate tire gauge. You cannot tell if a tire needs air just by looking. It could be underinflated by 10 pounds and still look fine. You can also bring the vehicle in and we can inspect the tires for you.